Discover Haiti's stunning coastline and discover the wonders that await you under the sea. Your adventure begins on a double deck catamaran fully equipped and ready to take you for a scenic ride to the snorkel reefs. This tour takes your average snorkeling adventure and elevates it to an experience you’ll never forget. After a quick briefing, follow your local guide as you embark on an unforgettable guided tour above the beautiful reef that tropical fish call home. Prefer to keep things above-board? You can spend the day sunbathing on the boat as you take in the beauty of Haiti’s North coast. • Caribbean Catamaran: Sail in style on a fully equipped, double-decker vessel. 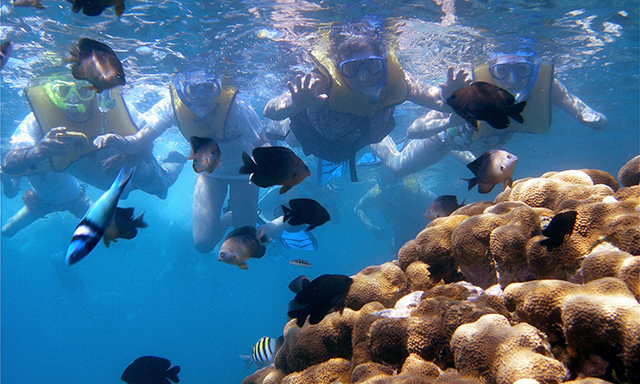 • Snorkel: Enjoy one hour of guided snorkeling. • Top Notch Gear: This tour features top quality snorkel equipment. • Guests with pre-existing neck, back, knee and/or shoulder injuries, cardiac conditions, asthma, diabetes, epilepsy, other heart or respiratory conditions or any other medical condition must take particular caution when selecting a tour — particularly tours categorized as “strenuous”.